Delightful small shrub with a rounded dense habit. 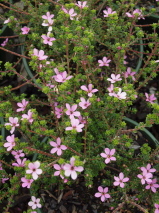 It is covered in rosy pink star-like flowers through winter and spring. Trim lightly after flowering. Plant in sun or semi-shade. Avoid heavy frost, tolerates some dry once established.